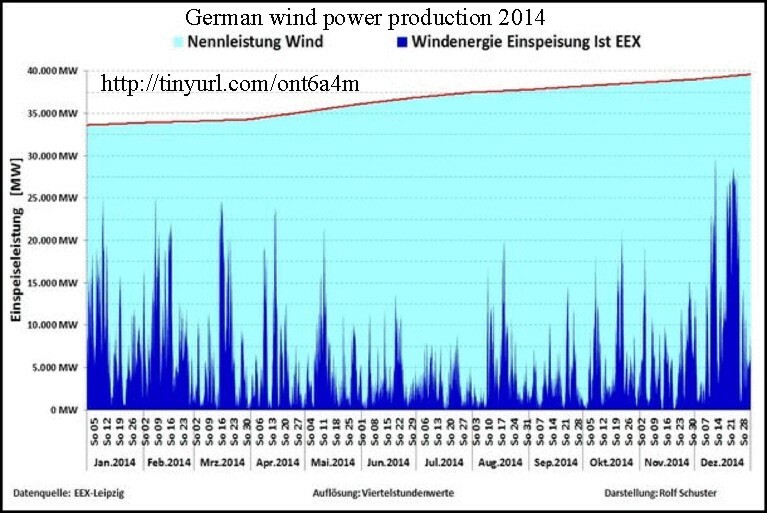 Germany is a leader in electricity production from wind turbines. In 2014, Germany had 25,000 wind turbines installed. Their total installed capacity rating is 39,612 MW. But as Pierre Gosselin reports, these turbines actually produced an average of only 5,868 MW or just 14.8% of rated capacity. Even wind turbine installations in the windy North Sea are delivering only 20% of rated capacity (see report here). This story shows the folly of replacing fossil-fuel or nuclear generation of electricity with solar and wind. In Europe as a whole, infrastructure investment in renewable energy (wind, solar, biomass) has consumed 600 billion Euros with little to show for it except high electricity prices (Source). The graph below shows the intermittent nature of wind energy, the light blue area is the total generating capacity; the dark blue is actual electricity produced. See: The effect of wind turbines on human health – “People who live near wind turbines complain of symptoms that include some combination of the following: difficulty sleeping, fatigue, depression, irritability, aggressiveness, cognitive dysfunction, chest pain/pressure, headaches, joint pain, skin irritations, nausea, dizziness, tinnitus, and stress. These symptoms have been attributed to the pressure (sound) waves that wind turbines generate in the form of noise and infrasound. Wind turbines versus wildlife – “The U.S. Fish and Wildlife Service (FWS) and American Bird Conservancy say wind turbines kill 440,000 bald and golden eagles, hawks, falcons, owls, cranes, egrets, geese and other birds every year in the United States, along with countless insect-eating bats. UPDATE: In a separate post, Gosselin adds in solar power and shows that in the last 30 days, in the dead of winter, both wind and solar power went AWOL three times. A new report on green job creation due to the policy of trying to switch energy production to alternative sources such as solar and wind energy has just been published. The report deals with the situation in the United Kingdom, but has parallels for U.S. policy. The author, Dr Gordon Hughes, is a Professor of Economics at the University of Edinburgh. He was a senior adviser on energy and environmental policy at the World Bank until 2001. He has advised governments on environmental policies and was responsible for some of the World Bank’s most important environmental guidelines. Claims by politicians and lobbyists that green energy policies will create a few thousand jobs are not supported by the evidence. In terms of the labour market, the gains for a small number of actual or potential employees in businesses specialising in renewable energy has to be weighed against the dismal prospects for a much larger group of workers producing tradable goods in the rest of the manufacturing sector. The government target for generating electricity from renewable energy sources will involve a capital cost that is 9-10 times the amount required to meet the same demand by relying upon conventional power plants. The extra investment required for renewable energy – about £120 bln ($194 billion) – will be diverted from more productive uses in the rest of the economy. Increases in the cost of energy together with the diversion of investment funds means that many manufacturing firms will either go bankrupt or relocate. The cumulative impact of these policies could amount to a loss of 2-3% of potential GDP for a period of 20 years or more. And, of course, in the U.S. there was this: the $535 million in stimulus cash lent to solar panel maker Solyndra, is now lost because Solyndra is bankrupt and out of business, having taken 1,100 jobs with it. And the wind turbines chop up birds. A new study from M.I.T. indicates that vast wind farms to generate electricity may raise local temperatures as much as 1degree Celsius (1.8 degrees F) on land, but have the opposite effect over water. That’s significant considering the IPCC was all exercised about a 0.6 degree Celsius temperature rise over the entire 20th Century. Currently only about 2% of electricity in the U.S. is generated by wind power, but the Department of Energy estimates that as much as 20% of electricity could be generated by wind by 2030. (That estimate may be just wishful thinking.) To generate 20% of our electricity by wind power would require installation of millions of turbines across the U.S. The M.I.T. researchers say that “using wind turbines to meet 10 percent of global energy demand in 2100 could cause temperatures to rise by one degree Celsius in the regions on land where the wind farms are installed, including a smaller increase in areas beyond those regions.” The researchers also suggest that the intermittency of wind power could require significant and costly backup options, such as natural gas-fired power plants. “In the analysis, the wind turbines on land reduced wind speed, particularly on the downwind side of the wind farms, which reduced the strength of the turbulent motion and horizontal heat transport processes that move heat away from the Earth’s surface. This resulted in less heat being transported to the upper parts of the atmosphere, as well as to other regions farther away from the wind farms. The effect is similar to being at the beach on a windy summer day: If the wind weakened or disappeared, it would get warmer. The researchers also said that large-scale wind farms would disrupt precipitation patterns, particularly at the mid-latitudes in the northern hemisphere. Citation: Wang, C. and Prinn, R. G.: Potential climatic impacts and reliability of very large-scale wind farms, Atmos. Chem. Phys., 10, 2053-2061, 2010. Finally, electricity generated from wind turbines is more expensive than fossil fuel or nuclear generation. The International Energy Agency (IEA) estimates that for commercial electricity generation plants that begin operations from 2015 to 2020, wind generation will cost $94 per megawatt hour capacity, versus $78 for gas, $69 for coal, and $72 for nuclear. (Source: IEA, 2009 World Energy Outlook). The U.S. Department of Energy’s Energy Information Administration estimates are higher. EIA estimates the cost of new generation will be $149 per megawatt hour capacity for wind, $83 for gas, $100 for coal, and $119 for nuclear. (Source: EIA, 2010 Energy Outlook). President Obama has touted production of “green” jobs by promoting alternative energy sources to produce electricity, especially wind energy. He has particularly pointed to the experience in Spain and Denmark as examples of what could be done in the U.S. However, the experience in those countries shows that all is not well. A research team from Madrid’s King Juan Carlos University produced a detailed, well-sourced paper: “Study of the Effects on Employment of Public Aid to Renewable Energy Sources ,” which shows that the “green jobs” program was an economic failure. This study found that for every subsidized green job created, 2.2 jobs were lost elsewhere in the economy. “The study calculates that since 2000 Spain spent €571,138 (Euros) to create each ‘green job’, including subsidies of more than €1 million per wind industry job.” “… the programs creating those jobs also resulted in the destruction of nearly 110,500 jobs elsewhere in the economy,” and that “each ‘green’ megawatt installed [including solar jobs] destroys 5.28 jobs on average elsewhere in the economy.” The study also estimates that between subsidies, and higher production costs, Spaniards would have to pay 31% higher electricity prices to repay the incurred debt. In Denmark, they produce 19% of their electricity from wind power, but to produce that 19% takes 75% of all jobs in the energy sector. A study from Denmark (http://tinyurl.com/mdfsju ) notes “that the effect of the government subsidy [to the wind industry] has been to shift employment from more productive employment in other sectors to less productive employment in the wind industry. As a consequence, Danish GDP is approximately 1.8 billion DKK ($270 million) lower than it would have been if the wind sector work force was employed elsewhere.” This study estimates that the per job subsidy for the wind industry was $90,000 to $140,000 US. The Danish Economic Council concludes: “The wind power expansion in the 1990’s is an example of a policy that was unprofitable from society’s point of view, even taking the economic advantages that the wind business enjoyed into consideration. ” As a result, the energy sector underperformed by 13% when considered on a value-added basis compared to other industries. If the Obama administration really wants to create jobs, perhaps they should rethink their energy policy.